Ok. I have read almost all the pages here and haven't seen anything like this, Its more of a peculiarity that I think should be noted. I am only going to post one image here, and then will explain whats going on. 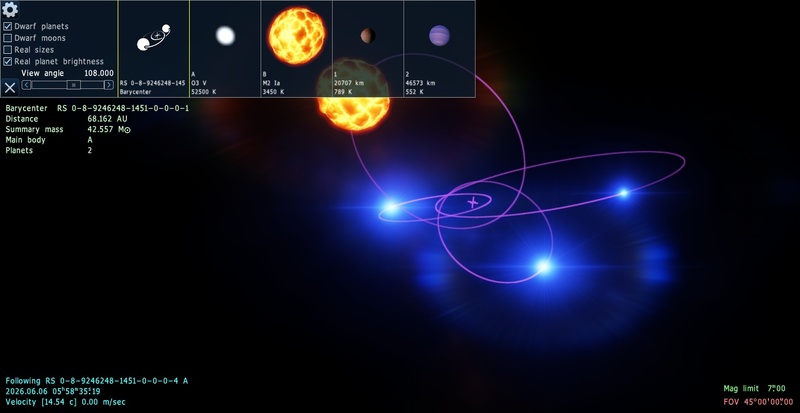 This appears to be a rather interesting quadruple system, and in reality it is. However the game isn't regestering it properly. Its treating this as two separate systems with two independent barycenters(which happen to be in the same place). I have been using this program for weeks and haven't encountered anything of such. and the other system registered separate is the two other stars. Its quite interesting and fun. It's not a quadruple system. 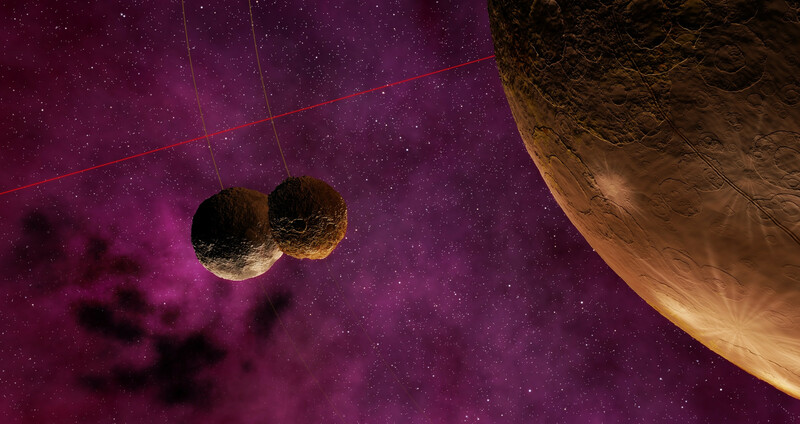 It's two binary systems that got generated on top of each other for some reason. A quadruple system could not have a configuration like that anyway, you would need to have more barycenters. Well most certainly not that way. They clip into eachother. Its the fact it generated that I posted here. Its the fact it generated that I posted here. Yeah. Every once in a while someone finds something like this. One time someone found the same exact system generated on top of itself. But generally these things don't happen. #2: recording seems limited to a file size of 4GB, and only the final frames get saved to file. Considering I'm recording video at 7680x1080, I only get a few seconds (172 frames maximum). #3: of those few seconds, some frame sequences are garbled (for example, the bottom half is on top, the top left is on lower right, the colors are offset...) but usually the last few frames are ok. On rare ocasions only the index is mixed-up and all the 172 frames are ok (but virtualdub thinks there are 406 frames). I guess this is because the saving is interrupted. I understand this is an unusual format, but the fact that it sometimes works keeps my expectations high. I'm running 0.9.7.1 on Win7 pro 64 bit, Intel I7 2600, 16GB ram, GeForce GTX 650. [!] 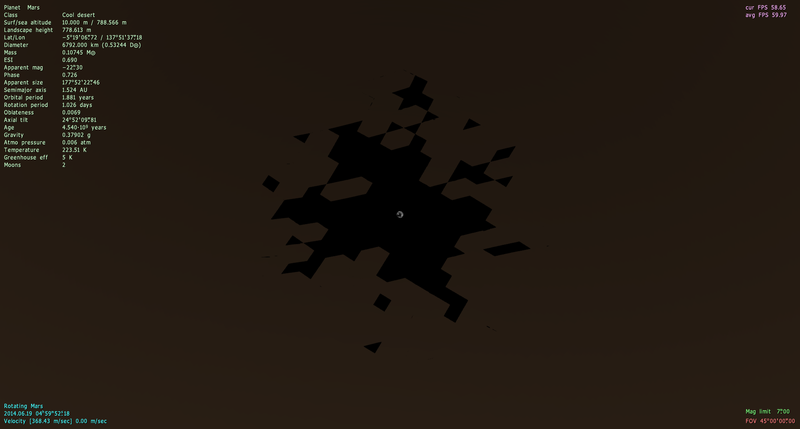 AVI: Invalid chunk detected at 2056. Enabling aggressive recovery mode. stream may be extremely slow. 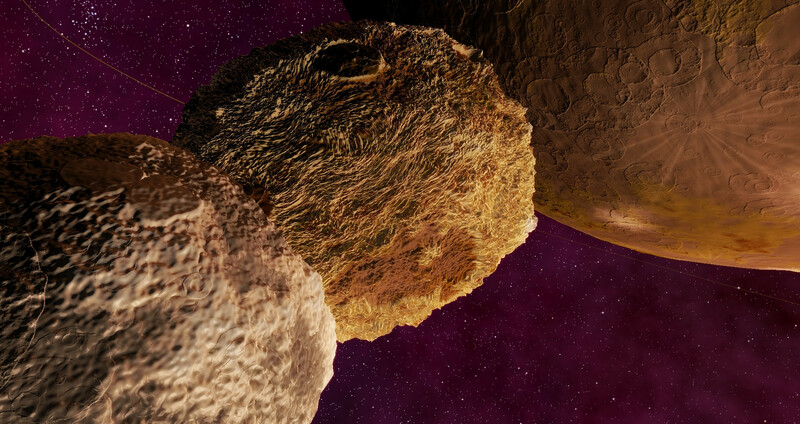 SpaceEngine's log shows nothing unusual, except perhaps "Total RAM: 4095 Mb". As for #1 above, I found that the codec list (should it be a drop down list?) isn't showing properly. If I select the shown item (uncompressed) and use up/down on the keyboard (or mouse wheel), the "configure" and "about" get enabled/disabled, indicating I'm choosing a different codec, and from that I can figure out which one. I think someone should try to respond to Docasman, it's quite important. I've also encountered the same problems. Maybe SE should have a formal video recording tool, with varius options to make fluid and spectacular videos with this amazing software. Appart from this, I've found an interesting bug. Colliding moons. There's a planet on Carina Nebula called RS 8409-1357-8-7184176-122 1 that has three moons. First I've noticed that one of the moons is extremly close to the planet. 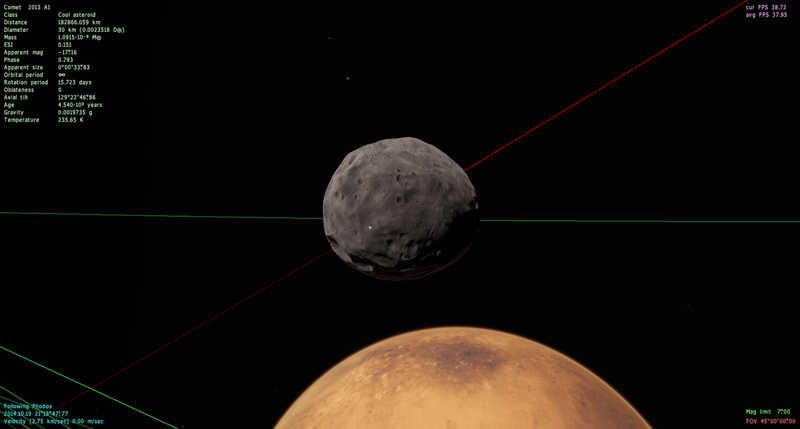 I've calculated that 160 km closer and it would surpass the Roche Limit creating a ring system. But that's not the bug obviusly because it's sufficiently far away to exist. The bug is because the second closest moon orbits so near to the first that they collide periodically fusing their surfaces toghether. I've seen this before on compact binary systems but no on moons, so I wanted to report this. 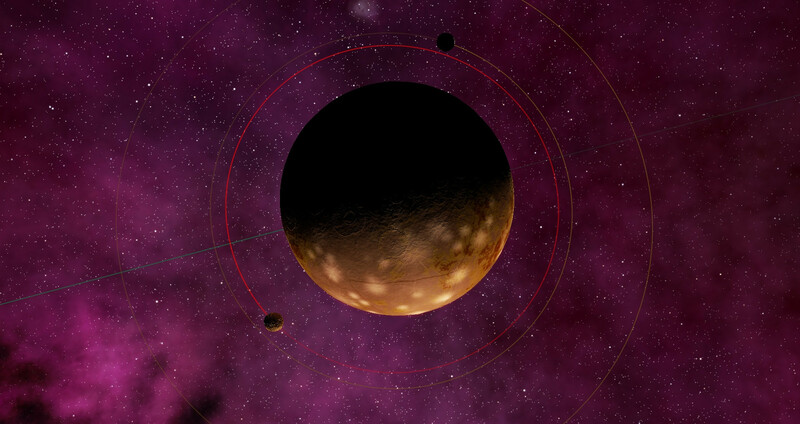 Also the third moon (in distance) is closer enought to disturb the orbits of the other two moons and making this entire system imposible. Docasman, your issue seems to pertain to virtualdub, not Space Engine. It is possible someone here may be familiar with the software and can help you, but your best bet is to go to whoever provides support for it directly. Better yet, use SpaceEngine to export the video frames (see below), and VirtualDub to process them. There are a great deal of advantages in using this method rather than using separate video capture software, such as seamlessness despite lag or low framerate. FastFourierTransform, and Docasman, SpaceEngine does have its own utility for exporting video frames. Consult the dedicated thread here. 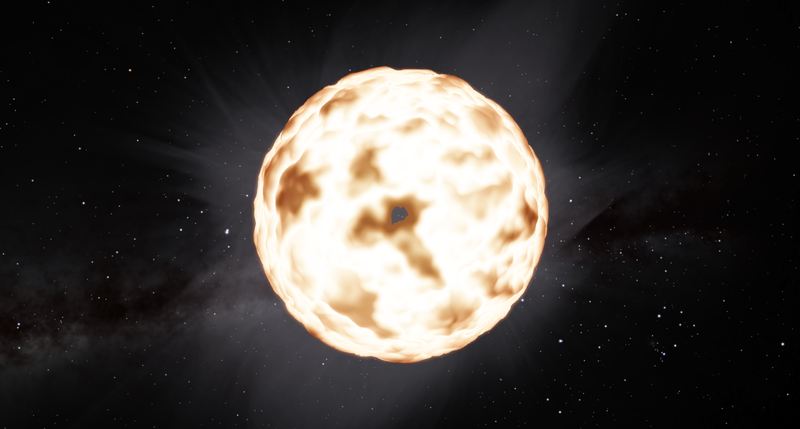 You can also view examples of people achieving great results with it in the SpaceEngine videos thread. FastFourierTransform, this is a known issue, and is not a bug but rather a limitation of the present state of how moon systems are generated. For both of you, I recommend using the forum search feature. I recommend using the forum search feature. Thank you. I used it but I've not found what i was searching (bad search). Docasman, SE can't record files greater than 4 Gb (or 2Gb, I don't remember), because it uses pretty old Windows video capture system. Just choose some compression encoder like DivX. FastFourierTransform, you have very weird looking craters. What are your specs? Do you use AMD graphics card? Thanks for your reply, Watsisname, but perhaps I didn't express myself correctly. I was using the utility. Pressing F9 shows a tiny window for codec selection and configuration, and I was expecting a drop-down menu... however clicking the tiny triangle doesn't show any option other than uncompressed video. However, selecting that option and using the mouse wheel (or up/down keyboard keys) enables the configuration button, which means I'm changing codec, and by the configuration window I can find which one is selected. SpaceEngineer, thanks for the confirmation. I can get 4 GB worth of video, which is not too bad now that I found the codecs are there. Unfortunately, I'm allergic to compression artifacts (my eyes twitch rather loudly) so I'm stuck with lossless compression... I found x264 does a great job at it, so the 4 GB might be enough for my needs. 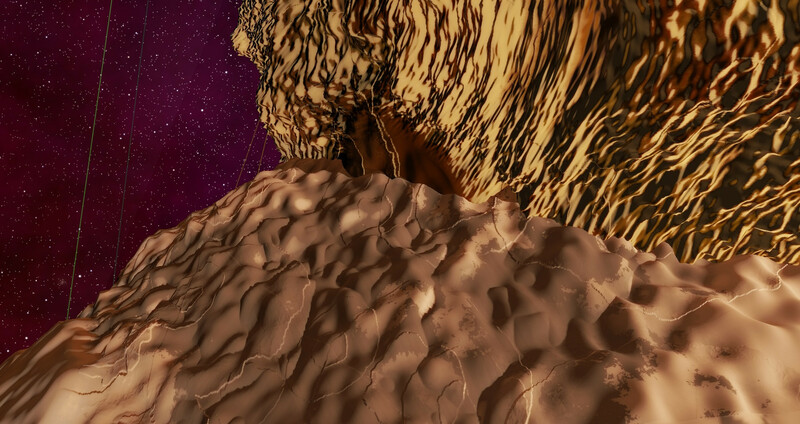 Now I'm trying to tackle the jumping textures and Moiré patterns on Mercury (high resolution surface map add-on). I'll post later about this when I give up. SpaceEngine does have its own utility for exporting video frames. No, this was replaced with the AVI recorder in the present version. This is what they're having trouble with. Oh, my apologies, guys! I wasn't familiar with the new video recording scheme. A quite annoying bug. Since a few days, I've been trying to add a cloud layer to some planets, and I didn't see appearing in the engine. Harb made me notice that the clouds are compressed as a small sphere at the center of the planets, and they are not following the rotation of the planet. 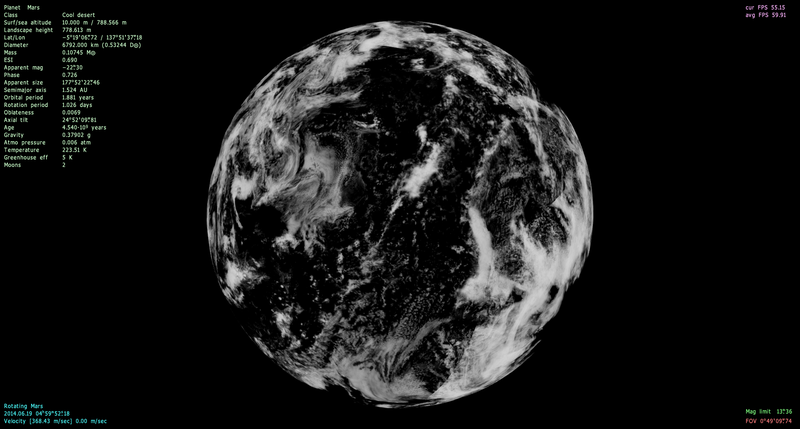 I tried to add the the radius ofthe planet on "clouds Height" parameters, but there are still graphical glitches. Look how they made for Earth. Did you forget some parameters? Show us the script. You have to clip through the terrain, use ambient lighting, and look at the center of the planet to see them. I have only had this problem with Mars. Even when I copy all of the Mars parameters to Earth and test it I still do not have the problem. It is only Mars. The bug also exists on a vanilla install with no mods.